Henry II was born in France and was the grandson of Henry I. He acquired more territories in France through his marriage to Eleanor of Aquitaine 1152. On being married he travelled to England where he pursued King Stephen to make him heir to the throne on account of his Grandfather. King Stephen agreed to this and King Henry II was crowned two years later in 1154. Henry II went on to become a powerful regent. He sought to establish the power and prestige of the Crown. However, this brought him into conflict with the Church. He had hoped that Thomas A Beckett would be a loyal Archbishop of Canterbury. But, Thomas a Beckett frequently stood up for the rights of the Church before the crown. Henry II got so frustrated with Thomas A Becket that tradition says he cried out in frustration ‘‘Who will rid me of this meddlesome priest!” – Four knights took him at his word and murdered Becket in Canterbury Cathedral. Beckett became a saint almost overnight and Henry II humbled himself to do public penance at his shrine. 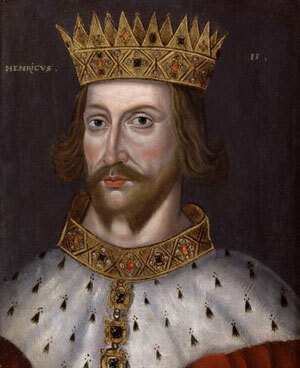 Nevertheless, despite setbacks with regard to the Church, Henry II did achieve much. Perhaps most notably was The Assize of Clarendon (1166) which established procedures of criminal justice, establishing courts and prisons for those awaiting trial. In addition, the assizes gave fast and clear verdicts, enriched the treasury and extended royal control. Towards the end of his reign, he travelled to Ireland to defeat a potential Norman Challenger to the throne. This established an English presence in Ireland. Though he strengthened the throne, his children became divided and squabbled over various issues including the succession. His own son John eventually turned against him and it is said this hastened his death in 1189.